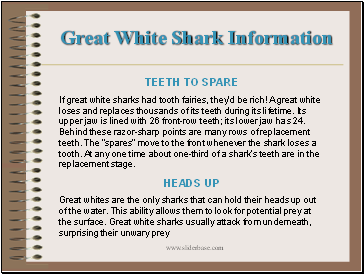 If great white sharks had tooth fairies, they’d be rich! A great white loses and replaces thousands of its teeth during its lifetime. Its upper jaw is lined with 26 front-row teeth; its lower jaw has 24. Behind these razor-sharp points are many rows of replacement teeth. The “spares” move to the front whenever the shark loses a tooth. At any one time about one-third of a shark’s teeth are in the replacement stage. 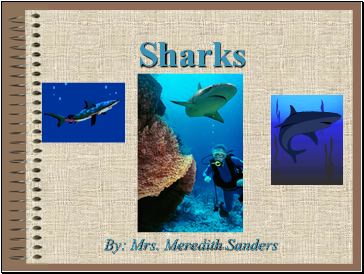 Great white sharks are superstars. Before the Star Wars series, the 1975 movie Jaws was Hollywood’s biggest moneymaker. 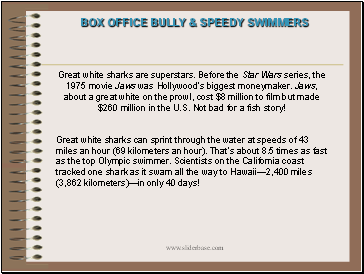 Jaws, about a great white on the prowl, cost $8 million to film but made $260 million in the U.S. Not bad for a fish story! Great white sharks can sprint through the water at speeds of 43 miles an hour (69 kilometers an hour). That’s about 8.5 times as fast as the top Olympic swimmer. Scientists on the California coast tracked one shark as it swam all the way to Hawaii—2,400 miles (3,862 kilometers)—in only 40 days! Unlike most fish, great white sharks’ bodies are warmer than their surroundings. 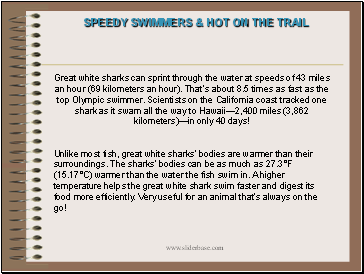 The sharks’ bodies can be as much as 27.3°F (15.17°C) warmer than the water the fish swim in. A higher temperature helps the great white shark swim faster and digest its food more efficiently. Very useful for an animal that’s always on the go! A pregnant female great white shark can carry as many as 14 babies in her belly. At birth, a 5-foot-long (1.52-meter), 60-pound (22-kilogram) pup looks and acts like a miniature adult. Great whites average between 10 and 15 feet (3 and 4.6 meters) long. Females tend to be bigger than males. The longest confirmed great white shark measured 19.5 feet (5.9 meters). Male or female, they’re the world’s largest meat-eating fish. A great white shark isn’t all white. A pale belly and dark charcoal-gray back help the shark avoid detection by prey. Viewed from above, the shark’s dark-colored back blends with the murky seafloor. From below, the shark’s belly matches the light-colored surface. Sneaky!